My big adventure trip has come and gone. Along with 38 of my closest friends and companions, I went to Quito, the Galapagos Islands, Quito, Coca, the Napo River Amazon rainforest, Coca, and Quito. This wonderful trip was put together by Jeff Wagg of College of Curiosity Field Trips. Quito is the site of very old (2000 BCE) settlements, and is named for the original Quitu people who lived in the area and were eventually conquered by the Incas in the 13th century. 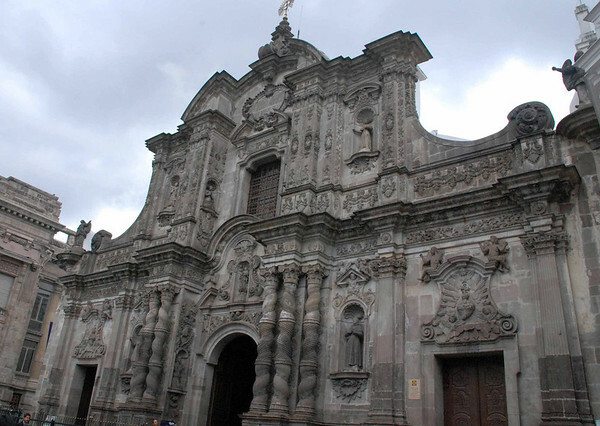 An Inca general razed the city in 1526 rather than let it fall to Spanish conquistadors, who later got their revenge by building churches all over on the site, beginning in 1534, and forcing everyone to convert to Catholicism. The Last Supper, featuring the local delicacy cuy. Served whole. the post-midnight arrival of my roommates, and the decision by the hotel that three women sharing a room is unseemly, which required them to bring in and erect a third bed at 1:00 a.m. At that point I was so tired, I could have slept in the bathtub. 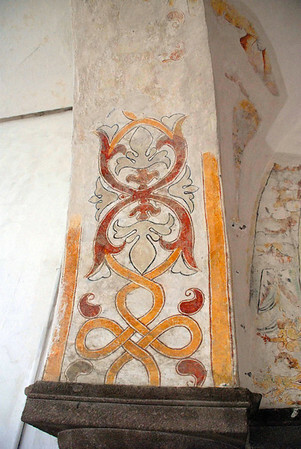 Inside of the church we didn’t see (via TripAdvisor.com) How many poor could this stuff feed, house, and educate? 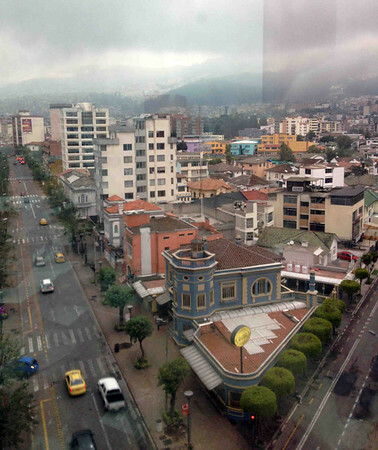 My first daylight view of Quito was from the 7th floor hotel room. Quito has many gray and foggy days, so many of my pictures have a bit of a gloomy cast to them. That doesn’t describe the city. Jeff had hired a coach for us to take a day tour around the area. We started with the equator and lunch on a volcano, which I will cover in my next few posts. After lunch, we went to the central plaza of town, where the churches are featured. Ecuadorians so love their churches. 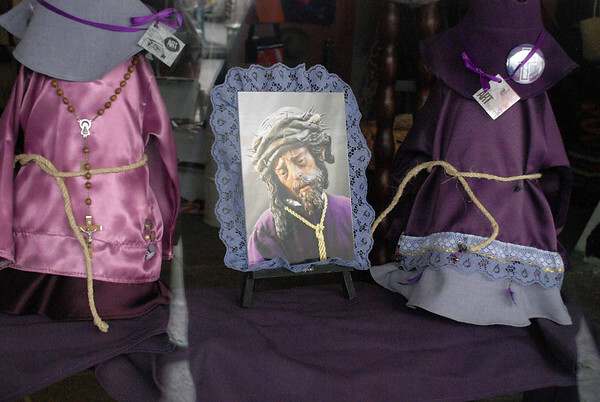 Fortunately (for our nerves and dislike of crowds) we missed the Good Friday and Easter spectacles, where hundreds of men dress in Klan-like purple outfits with pointed caps, representing the Spanish flagellants of the early Middle Ages and the Spanish Inquisition. We weren’t expecting that. But, this is a very big celebration in Ecuador, and I’ve been assured that the parades worth attending. Not being Spanish descendant nor Catholic, I don’t want to get this wrong, so you can google Semana Santa for more information about the Holy Week in Spanish culture. Easter is purple time. A lot nicer than the American white ones, eh? Old Town Quito has been refurbished over the past few years, and street vendors ushered out of the middle of the street and into a central mercado area away from the historic district. 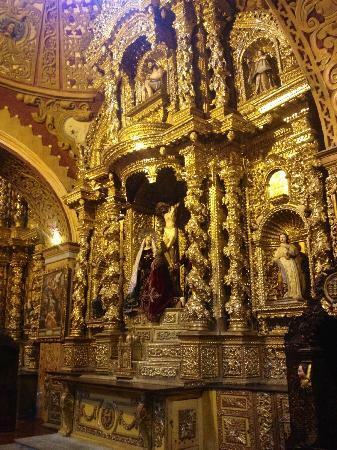 Our guide, a native of Quito, took us to see their famous churches. The Iglesia de la Compania de Jesus has over-the-top gilding inside, but since we were there a few days before Easter, visitors were not allowed. 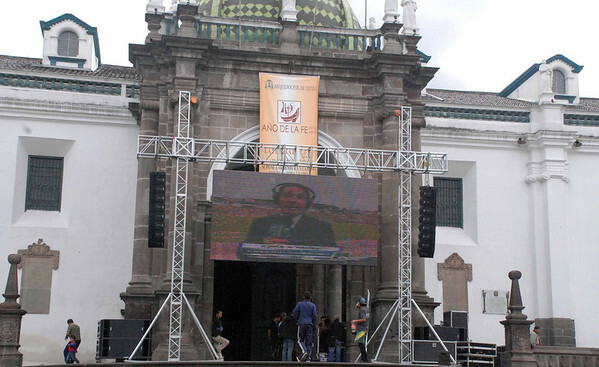 Instead, we stood outside and were chastised for blocking the view of… the soccer game, which was being broadcast on a giant screen mounted above the main church doors. Apparently soccer is a big deal outside of the U.S. Next to the churches, soccer is a big deal, and an important match was being played in town that night. We could hear the stadium cheers from several blocks away. 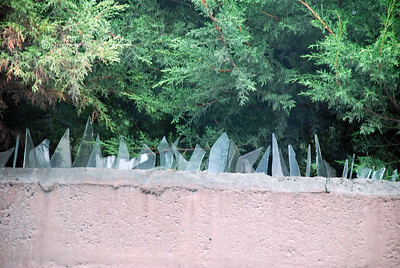 Common fence topping around private homes and businesses. The Ecuadorians are very proud of their city, which was the first one to be added to the UNESCO World Heritage Sites list. In the Old Town, the central plazas, and the gringo areas of nightclubs and restaurants, a heavy police presence discourages pickpockets, although we noticed at least one individual mixing in our group and pretending to take pictures as he moved closer to our backpacks. We all have known each other for years, and still didn’t realize he was with us, but the police did. Several times we were told by locals that central Quito was quite safe, but that the edges of the city were not. 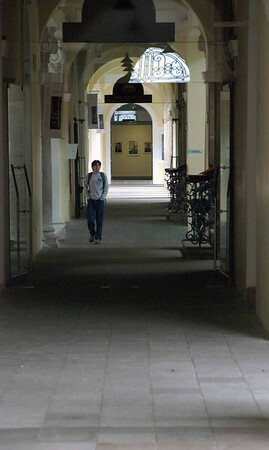 We walked through the market area, the Church Central area, and a ten block radius of our hotel both at night and during the day, and always felt comfortable. The streets were filled with young people at night. Indeed, the bars don’t close until around 3 a.m.
Dinner with a few friends. The waiters insisted on getting up a table all together! 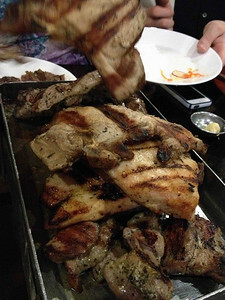 The second night, most of us trooped to a nearby paradilla (“Meat-o-Rama”) where we had massive amounts of brazier-grilled chicken, pork, and beef, accompanied by salad and potatoes, with ample South American wines and beer, for around $25 per person. However, you can make a lovely lunch of hearty soups for $3. I was quite charmed by Quito, and found the people friendly and the town clean and I look forward to making future trips there. I guess I was expecting a Third World country. Ecuador is not wealthy, but the people seem content, we saw no beggars, they are proud of their management of the rainforest, and they are busy going about their lives in the midst of spectacular natural beauty. 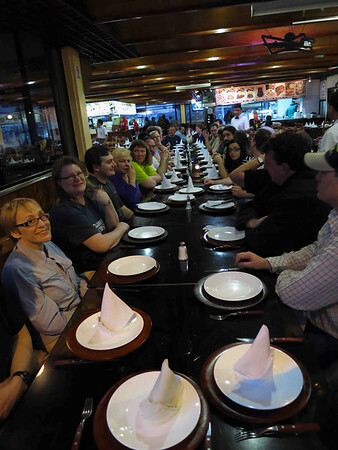 After the end of our trip, we spent another afternoon and evening in Quito, which I will cover in Part 2. 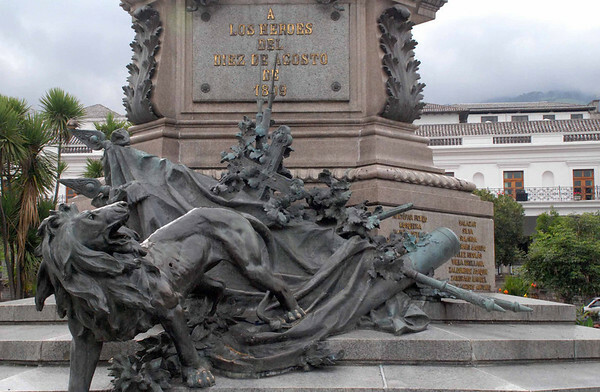 Ecuador declared independence from Spain in 1809, mainly to get away from the French Joseph Bonaparte. Spain crushed the independence movement, which returned and prevailed in 1820. A part of the world I have never been to. I’m sure it was very interesting..especially lunch in a volcano.